The Bass Rock is a famous island located in the outer part of the Firth of Forth, just east of North Berwick. Due to its large population of North Atlantic gannets, David Attenborough has described the island as ‘ One of the Twelve Wildlife Wonders of the World’. 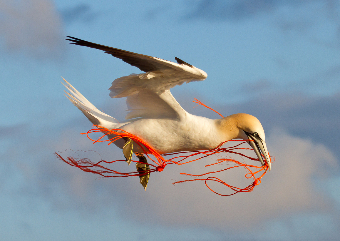 With over 80.000 nests occupied by gannets make sure you bring a camera along to capture the lifestyle of these remarkable birds. If you want to learn more about these spectacular creatures, North Berwick is home to the Scottish Seabird Centre, where you can view close-up live video footage of the gannets with solar powered cameras and take boat trips to the island. The Bass Rock is not only famous for its wildlife. The remains of the castle which was used as a prison during the early 15th century attracts many curious visitors. Following this the island has inspired many works of fiction and featured in Robert Louis Stevenson’s ‘Catriona’. There is also a lighthouse and an old chapel to explore.